PA-10.1D with 2 TA-10.2P for supporting floor-stand speakers. 2. Trends PA-10 Tube Headphone perfect for integrating PC. 4. Audio System by using Trends PA-10 and Trends UD-10. 5. 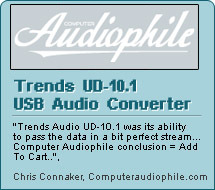 Audiophile Headphone System by using Trends PA-10 and Trends UD-10. 7. Using Trends PA-10 Tube Headphone into iPod & mini Amp. 8. Using Trends PA-10 Tube Headphone into iPod. 9. Trends PA-10 as a Tube Headphone amp. with the PC.